Be the first to share your favorite memory, photo or story of Tina. This memorial page is dedicated for family, friends and future generations to celebrate the life of their loved one. 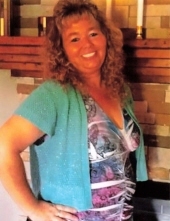 Tina Lou Ann Gabbard was born November 4, 1973 in Manchester and departed this life Monday, March 25, 2019 at the Wayne County Hospital in Monticello, being 45 years of age. She was daughter of Sally Hacker Gabbard Fields of McKee and of the late Isaac Burnis Gabbard. In addition to her mother, Lou Ann is survived by three sons, David Ray Eversole of Annville, Delbert Ball Jr and Jonathan Ball both of Tyner and by her boyfriend, Bill Rednour of Monticello. She is also survived by the following siblings, Jason (Lyn) Gabbard of McKee, Burnis Ray Gabbard of Annville, Julie (Jackie) Deaton of McKee, Ruthie (Robert) Abney of Irvine and Brenda (Shelby) Deaton of Manchester. She was blessed with one grandchild, Braelynne Ball. Other than her father, Lou Ann was also preceded in death by a nephew, Clarence Culton and by two brothers, Isaac “Ike” Gabbard and Gary Gabbard. "Email Address" would like to share the life celebration of Tina Lou Ann Gabbard. Click on the "link" to go to share a favorite memory or leave a condolence message for the family.